Typography & Graphic Communication student, Matt Standage, has been working together with Meteorology student, Rachel Bartlett and Psychology student, Shyamali Abraham on a joint project between the University’s Meteorology Department, Centre for Information Design Research and Psychology Department on the communication of probabilistic weather forecasts. These are forecasts that show the chance of rain as a percentage – often used in American weather forecasts but less typical in the UK. In this study we are looking at people’s response to percentages presented as numbers, words (likely, unlikely etc.) and through graphic representation. The project is part of the University’s Undergraduate Research Opportunities (UROP) scheme. 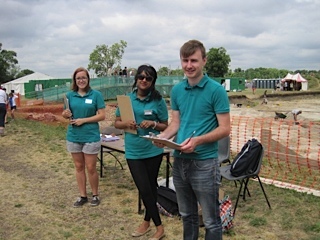 In the picture (top) you see the UROP team poised to hand out questionnaires to members of the public visiting the Archeology Department’s open day at Silchester last Saturday. The republic responded generously by taking time to complete our questionnaires, indicating what types of information they typically use to make weather-based decisions and how they prefer to see information about the chance of rain in forecasts. 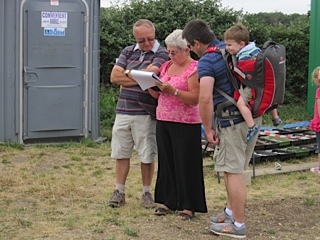 Some 250+ questionnaires later we’re very grateful to the Silchester team for hosting us, to all who kindly allowed themselves to be distracted from their visit to the dig to respond to the questionnaire and also to the many people in Reading town centre who also took part in the research. This entry was posted in Announce and tagged probabilistic information, UROP, Weather forecasting. Bookmark the permalink.